Have you considered cedar Imitation is the sincerest form of flattery. Did you ever wonder why so many other products want to imitate Cedar Man made materials cannot match the versatility, proven track record and environmental benefits of using Cedar. When specifying materials for your next project don't be disappointed, insist on Western Red Cedar. Used both outdoors and indoors for centuries, Western Red Cedar is renowned for its naturally occurring resistance to moisture, decay, and insect damage. Western Red Cedar is the ideal choice for many end uses and projects. Western Red Cedar's exceptional beauty brings warmth, character, and longevity to your outdoor living space. Western Red Cedar is carbon neutral, produces fewer greenhouse gases, requires less energy to produce than alternatives, and comes from a renewable, sustainable resource. Western Red Cedar is easy to install for both the professional and the do-it-yourself. Our best-in-class decking offers superior durability, timeless looks and decades of splinter-free fun. Thanks to proprietary, high-performance shell technology, Transcend maintains its true-to-nature vibrancy with only minimal upkeep. The unmistakable grain of our Transcend decking mimics the one-of-a-kind beauty of exotic hardwood, without any of the hassle. And when it comes to deck design, our Decking & Railing Duos can give you an idea of what's possible. Plus, you can feel good about your purchase, since Trex is made from 95% recycled materials. Veranda Elite composite decking's distinct variegation brings indoor design elements to the outdoors. With an unmatched look, Elite combines ultra-low maintenance with lasting beauty. Available in four colours: Panama Grey, Brazilian Ash, Exotic Jarrahwood and Tropical Kauri Brown. Backed by 25 year structural, and stain and fade warranties you can rest assured that your deck will maintain its look and its value for years to come. 1-inch x 5 1/4-inch x 12 ft. 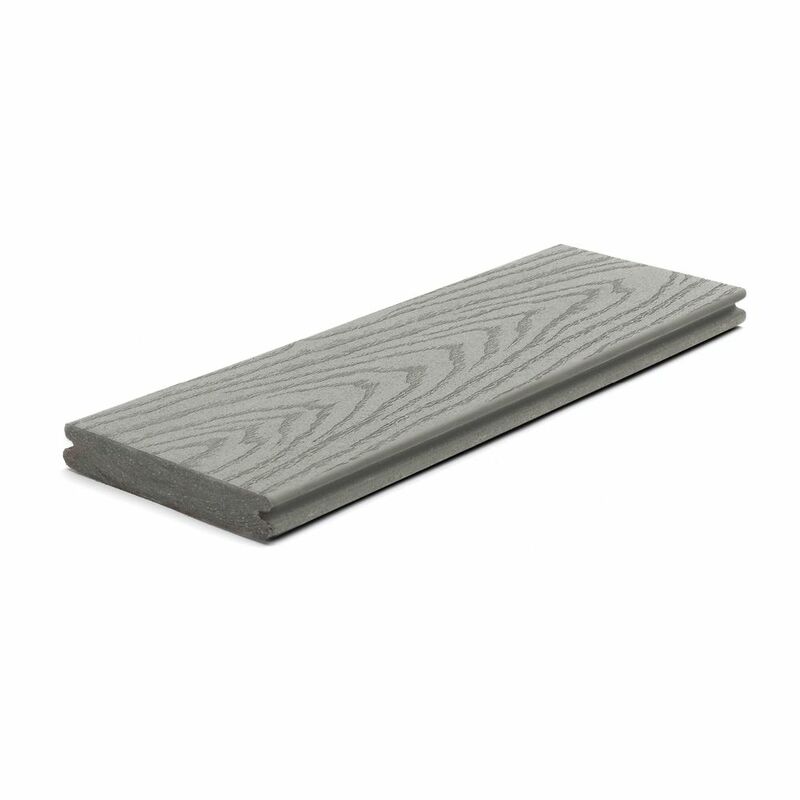 Select Capped and Grooved Composite Decking in Pebble Grey Trex Select brings legendary luxury to your home more affordably than ever. Durable and inviting, Select is the perfect, go-with-anything decking that retains its beauty for decades with only minimal upkeep. And when it comes to deck design, our Decking & Railing Duos can give you an idea of what's possible. Plus, you can feel good about your purchase, since Trex is made from 95% recycled materials.